Texas has seen a steady 10 percent increase in its population. It's the fastest growing State in the U.S. outdoing California and New York. Texas remained the national leader in home construction, accounting for 15 percent of permits issued across the country. Texas' healthy economy supports strong housing demand. Population growth cannot support new constructions fast enough. 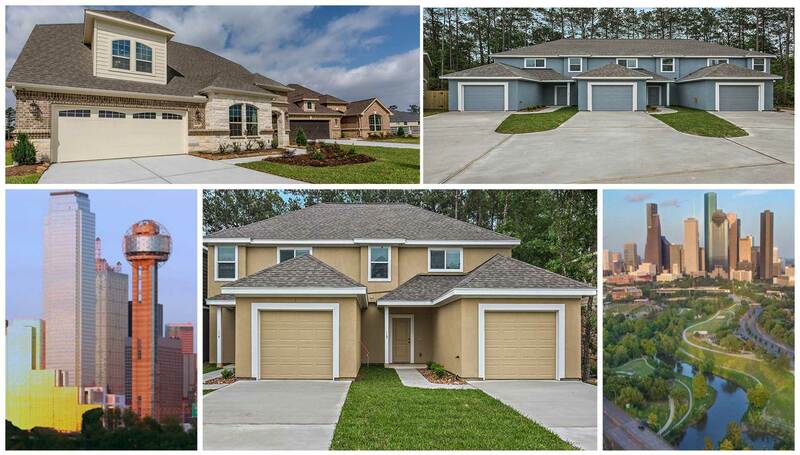 You have found the number one source for Real Estate Investment Opportunities in Texas. This site is a starting point for seasoned investors as well as new investors considering investing in Texas Real Estate. We also welcome REALTORS and other Real Estate Professionals from across the country who refer their clients to our company. Texas Investor Homes sells BRAND NEW single-family investment homes and other creative investment opportunities to Investors like you nationwide. Our motto is “Turn-Key Properties for Investors”. We provide all the resources to make it easy. We also provide Property Management for tenant acquisition, Financing, Home/Property selection, Counseling on Investor strategies, connections to the builders and personal service that is second to none! Model home leasebacks from builders and long-term rental homes for real estate investors are just a few of our popular programs. Our focus is on greater Dallas, Ft Worth, Austin, San Antonio and Houston Real Estate opportunities for Investors. What type of property is best for you? A traditional rental home? A model home leaseback? We can guide you to recommend the best fit for your investment goals. You don’t need to worry about buying one of those TV courses about Real Estate to be successful. Keep your day job and we will pull together deals that work for you. We already have home package discounts built-in because of the volume of homes we buy for investors nationwide. Leverage our buying power at no cost to you. All of our years of experience, networking, negotiating skills and resource guidance cost you nothing. We only make money if we are successful at putting the RIGHT investment properties together for you. The sellers pay us and you get our experience and expertise as a bonus! Be wary of builders or sellers who tell you that “you can save the REALTOR commission if you buy directly from us.” Almost everyone who does not use our services pays more for their properties in one way or the other. Our specialty in Texas is BRAND NEW construction for Investors. Allow us to show you why you need to consider NEW over pre-owned for your real estate investments. Our lowered risk strategy will help prevent the slow, painful financial drain that many investors experience. We provide personal service that is tailored to your needs, not the needs of the builder or the lender. Your calls & emails will be returned promptly.